The history of New York City’s Harlem neighborhood is deeply rooted in the tradition of art and storytelling. Longtime residents sit on building stoops, watch passersby, and take note. They are the oral historians here, in the birthplace of the African-American cultural revolution of the 1920s–30s, known as the Harlem Renaissance. They also hold the memories of more recent events, such as the race riots of the 1960s and the crack cocaine epidemic of the 1980s, which ripped apart Harlem’s social fabric, block by block. But as with all destruction, there is rebirth, and Harlem is being reborn today as many other New York City neighborhoods are. Due in part to its charming and historic architecture and convenient location, along with residential rezoning and housing cost increases elsewhere in the city, Harlem is gentrifying. And while gentrification brings its own set of problems to a community’s longstanding residents, the problems that extremely low-income families face in accessing housing have not changed in decades in Harlem. It was those residents’ plight that first led Ellen Baxter, executive director of Broadway Housing Communities (BHC), to take action over 30 years ago. She founded BHC (known then as the Committee for the Heights-Inwood Homeless) in 1983 to create permanent supportive housing in West Harlem and Washington Heights. In 1986, BHC opened The Heights, a 55-unit apartment building on 178th Street in Washington Heights. Three more buildings followed between 1986 and 1991, providing a total of 136 units of conventional permanent supportive housing—serving single adults in need of wraparound services for severe chronic or mental health issues, addiction recovery, or physical disabilities. In 1991, BHC’s The Rio opened with 75 units and a community room. At the time, the prevailing idea in government was that single individuals and families with children had to be housed separately—far different from the reality of most neighborhoods. “They missed the point, totally,” says Baxter, who set out to break the constraints of the city’s supportive housing model by demonstrating that another way could work. During the changing of mayoral administrations in 1990, BHC created seven two-bedroom apartments in The Rio, and moved families in. “We felt that was a good time to do things that were innovative—there was no one to ask,” says Baxter, laughing. Rodriguez asked if she could conduct an experiment: take The Rio’s community room and, instead of posting generic pictures, start hanging original artwork. Rodriguez says that she had no idea how the plan would go over, but she knew there were many artists in Washington Heights and Harlem who had no spaces to display their work. Despite the worry, the gallery was a hit. “The community room became a community gallery,” says Rodriguez. The first people to see the work were the tenants, who Rodriguez recounts were shy to mingle at first, but by the end of the first opening night event were relaxed and talking to the artists and one another. Rodriguez immediately began developing a roster of artists who wanted to display their work. Artists would set up their displays at night, and before Rodriguez could enter the building the next morning, she says tenants had critiques for her of the work that had been installed. “We realized that it had to be a permanent fixture because it had a kind of healing property. It made people talk to one another—they didn’t have to like the art, but they were talking and looking forward to the next artist,” she said. The addition of art, and artists, into the building was a beneficial process that happened naturally and without much discussion, Baxter recalls. “The artists, the activity, musicians coming in [to play at openings], had its own strength that just took off,” she says. The Rio Gallery was one of the first art galleries in North Harlem, and it continues to have a loyal following of local artists and art lovers of largely Latin American and African-American art today. Almost 20 years later, Rodriguez describes the community gallery as “a little piece of paradise,” with a doorway that leads to a rooftop garden. “Folks coming from the community became enchanted with this lovely garden, which was unlike anything they’d seen in Washington Heights.” Rodriguez says the gallery fed both populations—the internal population of building residents and the community at large, who—without any formal introduction to BHC’s work, just a desire to experience art—began to visit regularly and came to understand what the building was about. The positive effects of art and youthful energy led to the incorporation of both a gallery and a preschool into BHC’s next housing project, the Dorothy Day Apartments, in 2003. Located on Riverside Drive, the Dorothy Day Apartments contain 70 studio, one-, two-, and three-bedroom apartments, along with the Rio II Gallery. Its Dorothy Day Early Childhood Center is funded by Head Start. Preschool-age residents of the building attend the school, but the majority of students are from the community at-large. Like the after-school program that preceded it, this melding has a beneficial effect on both groups. Having a school in the building builds a sense of ownership and community in the young residents of the Dorothy Day Apartments, Baxter says, as the children see their teachers in the building after they’ve graduated, and often stop in to visit. The school has “a small, village-like impact [that] brings parents together, brings neighbors from down the block, families [of students] from years ago, and builds [a] communal feeling,” she says. Charlene Melville, who was lead educator at the Dorothy Day Center for nine years, says that art is an integral part of the children’s instruction, and that the school worked closely with city museums to enhance its Head Start curriculum. Both Baxter and Rodriguez point out that the prevalence of art in their developments was never a calculated move, but it became clear that it was an element that would transform the children’s work. BHC’s largest and most ambitious art-and-housing project to date was conceived over a decade ago. Rodriguez recounts that a group of BHC’s after-school program attendees were participating in a citywide art program that came to a halt with the attacks of Sept. 11. When the program resumed over a month later, the emotional effect of the event on the students was palpable. The program’s facilitators shifted course and made it the basis of the children’s art making. Textile artist Faith Ringgold, who had been asked to review the children’s visual art, poetry, and essays, brought it to her publisher. A compilation of their work was released as a book called What Will YOU Do For Peace: Impact of 9/11 on New York City Youth. Rodriguez says the children’s artwork became the inspiration of Ringgold’s own 9/11 Peace Story Quilt, and Ringgold, a Harlem native, developed an affection for the children, their families, and the building after attending an exhibition of the children’s artwork at the Dorothy Day apartments. “She began coming to Day at least once a month, and we don’t know exactly when the conversation started about a museum, but it grew from her,” she says. Standing at the corner of St. Nicholas Avenue and 155th Street is The Sugar Hill Project. Opened in 2015, it is the physical manifestation of BHC’s evolution, and wraps affordable housing, art, and early childhood education within an impressive, 13-story structure. Designed by David Adjaye, the award-winning architect widely known for his design of the National Museum of African American History and Culture in Washington, D.C., the building honors the neighborhood’s designation as the country’s only Heritage Rose district with rose-embossed panels on the exterior. It contains over 190,000 square feet of space that houses 124 apartments, the Sugar Hill Museum Preschool, and the Sugar Hill Children’s Museum of Art & Storytelling. 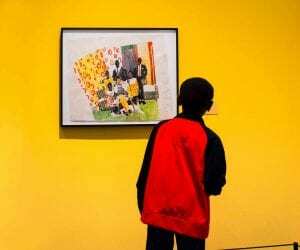 The museum features art exhibitions by Harlem and northern Manhattan artists, and its programs are designed “to nurture the curiosity, creativity, and cognition of children ages 3 to 8,” with a heavy emphasis on storytelling. In addition to a 20 percent residential commitment to homeless families, 48,000 applications were received for the 98 lottery units (one is a superintendent apartment). Of the lottery units, 10 percent are for households earning below 30 percent of New York City’s area median income (AMI), 60 percent are for households below 50 percent AMI, 10 percent for those below 60 percent AMI, and the balance are for a mix of households between 60 and 80 percent of AMI. The 9th floor houses BHC’s offices, another gallery and event space, Rio III, with spectacular views of the city. BHC wove together 13 funding sources for the Sugar Hill project. Private lenders, philanthropy, Low-Income Housing Tax Credits, and HOME funds allowed BHC to achieve an income mix that reached the lowest income band of Harlem residents in the housing portion of the building, and New Market Tax Credits financed the museum and education spaces. Baxter recalls how grueling the funding structure made the construction process. “Each requisition had to be broken down 13 ways,” she says. “[Documenting] who’s paying for every [element] presented a real challenge.” Conversations were as detailed as who was paying for the walls separating the preschool, museum, and housing portions of the building. Outside of financing, the site was a brownfield, yet located in a state and national historic district. There were residential rezoning requirements, construction union pressure, and a gauntlet of city reviews and approvals that had to happen in sequence in order to keep the project’s funding from slipping away. Nonetheless, it was worth it. “[The Sugar Hill project was] definitely an evolution of the practice and the lessons we’d learned over the first five buildings,” says Baxter. “We knew we were going to think like a for-profit developer for a change, [in that] the more square footage you have to work with, the more you can do and the more sustainable it is, economically.” Baxter notes that while the museum will likely not be financially self-sustaining for a few more years, expanding BHC’s funding streams beyond housing and early education and into the arts will be beneficial to its overlapping programming. The first thing you notice about the Sugar Hill museum is its light. Though large for a children’s museum, each area is used to its maximum potential. The gallery’s main space, called “the living room,” has an atrium feel, with oversized art pieces lining the walls, and a section of wall near the entrance that has child-sized stadium seating for performances. At the other end of the long, open space is a low stage, where on the Saturday I visited, Sonia Manzano (“Maria” from television’s Sesame Street) would soon be reading from her newest children’s book and Sugar Hill’s newest artist-in-residence would be introduced. On the other side of the main gallery are the “labs,” rooms filled with low tables and chairs, and shelves filled with art-making supplies—paper, dried flower petals and greenery, glue sticks, scraps of fabric, and colored pencils. Staff members walk around offering assistance, praise, and encouragement to children working on collages. 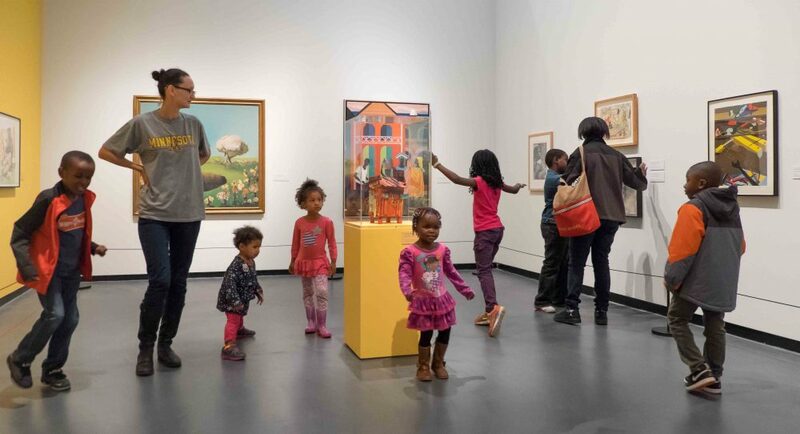 With the museum’s target audience of children ages 3 to 8, “the programming should engage both adults and children,” says Baxter. She notes that Charlene Melville, now BHC’s education director, works with museum staff to develop new methodology to engage adults. “Some parents are more familiar with engaging in play and art-making, and some are not. It’s about being flexible and creating lots of diverse opportunities—including through music and storytelling,” Baxter says. The museum’s storytelling programming includes weekly performances by storytellers with roots in the community and two monthly features: Story Time, which is the telling of culturally diverse fables, tales, and myths, and includes participatory activities where children share their own art and stories; and History Tales, which presents the stories of actual Harlem and Upper Manhattan residents. Story subjects have included Salsa legend Celia Cruz and the Sugar Hill neighborhood itself. Beyond the museum’s storytelling focus, it also offers music performances, drop-in workshops, and an art camp during holiday school breaks and summer vacation, where some teenage residents of the building work as junior counselors. One of Sugar Hill’s tenants is also among the museum’s resident storytellers. Even with a full programming calendar that includes evening artist meet-and-greets for adults, the museum’s most frequent patrons are the ones who only have to come from next door. The preschool’s curriculum follows an educational philosophy known as Reggio Emelia (named for the Italian town that developed it after World War II), which centers on using the arts as a form of expression in everyday life and fostering a respect for community and appreciation of the natural world. The philosophy influenced the physical design as well. Adjaye left ductwork and steel beams exposed so the children can see how the building was constructed. Floor-to-ceiling windows allow the children to see and talk about what’s happening outside the classroom. Good article, Keli. I don’t often associate affordable housing and art together, but it’s good to see this ‘museum’ have such a positive impact on its community.